JAMRUD, KHYBER AGENCY, FATA, PAKISTAN – Kabir Afridi gingerly makes his way through the bustling bazaar in Jamrud, past hawkers offering everything from cheap cell phones and fresh fruit to heroin and American military boots and flak jackets. Located in Pakistan’s Federally Administered Tribal Areas (FATA), along the highway between Peshawar and Kabul, the bazaar offers, among other things, items pilfered from the stream of trucks carrying supplies to American forces in Afghanistan. Few of the thieves are caught. And then there are the chronic militant attacks. FATA has earned a reputation for chaos. President Obama, justifying more than 400 drone strikes that have hit the region, describes a “remote tribal” territory where Pakistan “cannot or will not effectively stop terrorism.” Academics and media organizations have taken to calling it a “lawless” place. This characterization is false, though, as Afridi can attest. There is law, if not stability. One morning last fall, Afridi was in the bazaar buying vegetables when his phone rang. “I got a call from a relative saying there had been an attack in our area,” he recalls. Gunmen had assaulted two tankers carrying fuel for American troops. Two drivers were killed and the trucks set ablaze. It was the third attack in a week on the same stretch of highway. Soon an officer from the Khasadar—a militia commanded by an Islamabad-appointed official known as a “political agent”—sought out Afridi, a bearded man wearing a flowing white tunic and a tightly wrapped turban. “There are orders from inside,” the officer told Afridi, as he brought him to a cell in the agent’s office. Within a few hours, Afridi was joined by twenty-five other members of his Tor Khel tribe. Afridi, who denies ever participating in violence, has been arrested four times for attacks on NATO trucks and three times for attacks on government officials. These arrests are legal. In FATA, locals are frequently imprisoned under the Frontier Crimes Regulations (FCR), a vestige of British colonial law that holds entire tribes responsible for certain crimes. 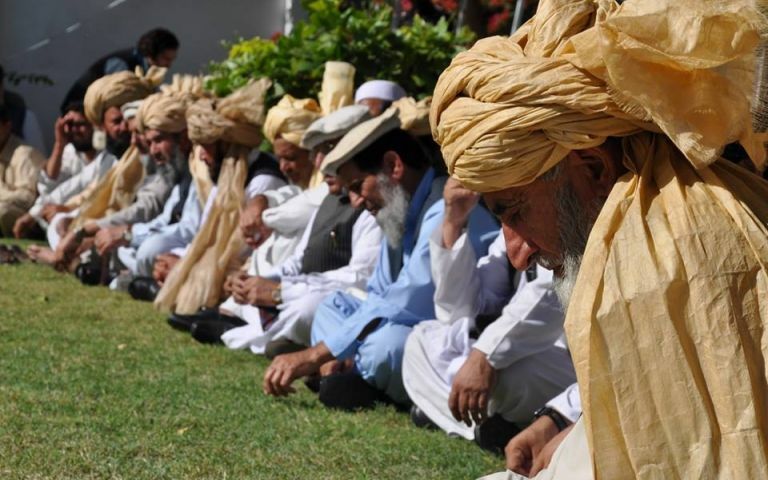 Pakistan’s constitution bars FATA’s 6–7 million residents from appealing FCR charges to the country’s courts. In 1893 the British established FATA as a buffer between Afghanistan and India. The FCR was born eight years later when the colonial rulers, unable to put down tribal insurgencies in FATA, struck a deal with elders: tribesmen were free to do as they pleased, but if there were attacks on British officials or interests, the Crown could carry out collective punishment. Colonial officials could blockade tribal land, imprison any tribesmen connected to the culprits, level their homes, and even exile them until the suspects were turned over. Since gaining independence in 1947, Pakistan has made few amendments to the law. Pakistan’s central government interprets the FCR as justification for abandoning FATA. Islamabad has no obligation to build schools, hospitals, or anything else there. Only 17 percent of residents are literate, and the per capita income is half that of Pakistan overall. Unless a dispute, even a murder, involves a government interest, tribesmen must find a solution themselves. Residents say the government’s hands-off approach has allowed militants to flourish, and locals find themselves caught between them and collective punishment from Islamabad. More than 100,000 Pakistani troops are now deployed in FATA to fight Taliban and al Qaeda insurgents. But these troops also confiscate weapons that tribesmen are allowed to keep under the FCR. Then government officials punish the tribesmen for failing to secure their areas from insurgents. “These are guys with machine guns and RPGs. How can we fight them when we don’t even have guns?” Afridi wonders. Eleven lawmakers from FATA sit in Pakistan’s parliament, but they are constitutionally barred from voting on legislation pertaining to their constituencies. Nevertheless, in September, they introduced a bill in Parliament asking their colleagues to lift the FCR, adding the region to an existing province or creating a new one. Their action comes after a long grassroots campaign. For years, FATA residents have held regular protests, and nearly every major political party has promised to meet their demands. But like most policies in Pakistan, the decision lies with the military, which has argued that it needs a free hand to root out insurgents in the region. For residents, the only way of defeating the insurgents is to replace the FCR with effective rule of law. Despite the protests and promises by political parties to lift the FCR and force accountability on the government, the army seems determined not only to keep the law in place, but even to reinforce it. A hundred miles south of Jamrud, the city of Bannu sits at the gateway to North Waziristan, scene of the latest Pakistani military operation in FATA. Officials are targeting Taliban and al Qaeda militants who set up here in 2009, when another operation pushed them out of neighboring South Waziristan. But it was not just militants ousted. Under the authority of the FCR, the military carried out a scorched-earth policy in South Waziristan, leveling more then 4,000 homes belonging to the Mehsud tribe, to which some Taliban leaders belonged. The FCR allowed the military to arrest Mehsuds across the country and close their businesses under the blockade rule. Hundreds of thousands of Mehsuds displaced in that operation are still barred from returning home. Qismatullah, one of more than one million who have fled the current assault in North Waziristan, smiles as he points to his newborn daughter, snugly wrapped in the tent his family of seven shares in a Bannu refugee camp. Qismatullah and his family left their village of Hormuz after a drone strike hit his neighbor’s home, killing, he says, dozens of civilians. The attacks officially target Arab and Central Asian militants. He blames the Pakistani military for failing to contain them. “They force some people to rent them rooms in their homes,” Qismatullah claims. “How can we fight them?” President Obama appears to agree, arguing that FATA must be subject to drone patrols and strikes because Pakistan is “unwilling or unable” to control it. In other words, the government has used the legal authority of the FCR to displace millions in Waziristan and then used that same authority to retreat, leaving the territory to a conflict between well-armed militants and hamstrung tribesmen, while drones whir overhead. According to tribal elders, the Khasadar Force has been overmatched by insurgents partly because the military funded and supported some factions of the Taliban. “Uzbeks, Tajiks, Arabs, they all came, and we feared the government, so no one could ask why they were here,” Malik Atta Mohammad, a tribal elder from North Waziristan, explains. The Taliban “got unimaginable funds from the military, and weapons.” He says the military and the insurgents have made deals without the input from the tribes’ elders, traditional deal brokers in FATA. Mohammad is lucky. The Taliban and al Qaeda have killed more than a thousand elders like him. “Eventually there was no one left to question them,” he says. “We would call jirgas and no one would show up,” he says, referring to the traditional assemblies where tribes make group decisions. This past spring, government officials, at the behest of the military, began asking tribesmen returning to North Waziristan to sign a new, harsher version of the FCR. Tribesmen must pledge allegiance to Pakistan and are barred from protesting the FCR. They are no longer officially allowed to keep weapons, leaving them, elders say, unable to fulfill their responsibility under the agreement to combat insurgents. According to Mohammad Adil, deputy director of the FATA Disaster Management Authority, around 110,000 residents—a tenth of those displaced—have signed the agreement and been allowed to return home.